There are a large variety of items and services that you can claim as an allowable business expense. The information on this page is for guidance regarding some of our clients’ more popular expenses, if in doubt please check with HMRC. As long as your accountant is charging for items that are related solely to your company, PAYE, VAT and Corporation tax returns, company taxation advise etc. Then HMRC will see the cost as tax deducatable. Assuming that you are not caught by the 24 month rule, you can claim for the cost of hotels and B&B’s near to the place of work provided you have another principal residence. The claim is allowable for contractors and freelancers that say live in one city and need to be in another. If you have come to the UK from overseas to work then claiming such expenses are unlikely to be allowable as that residence is likely to be classed as your normal residence. Should rented accommodation be more economical and practical, it can be treated as an allowable expense provided the costs are reasonable. Should HMRC view the costs as excessive then they are likely to take the view that the accommodation is of personal benefit and are likely to challenge the claim. When signing up for a rental agreement or lease, it should be in the companies name and paid for directly by your company. It is important to remember that there must be no personal benefit to any claim such as providing residence for family members, i.e. it must be necessary, wholly and exclusively for the purpose of the business. Expenses incurred in providing an annual health check. This is classed as a physical examination of an employee by a health professional for (and only for) determining the employee’s state of health. This does not cover medical treatment. An asset is something of value that is owned by your business such as computer equipment or machinery. An asset is often described as something that has value and that is able to add value to your business, for example, a video camera owned by a media company. The camera in its own right is owned by the business and has value plus it is used in the day to day activities of the business to add value. An asset is recorded in inniAccounts in a different way to an expense. When you record your asset it will be included in your asset register. The way expenses are claimed is dependant on who owns the bike. If the bike is owned privately, 20p per mile can be claimed for business mileage. Alternatively, the Cycle to Work Scheme allows employers to purchase bikes and safety equipment and provide them to employees. The scheme must be open to all employees and the bicycle must be used for business purposes more than 50% of the time. The equipment is tax deductible for the business and is loaned to the employee with no benefits in kind (P11D) liability for the employee. Note that the 20p per mile tax free mileage allowance for business travel cannot be claimed if the bicycle is owned and loaned to an employee by your company. There is no limit on the cost of the equipment including the bicycle, however, if the value of the equipment exceeds £1,000 a consumer credit license is required from the Office of Fair Trading. Full details of the scheme can be found here. If you do purchase a bike through the company all you need to do is record the purchase by selecting the purchase an asset option in your bookkeeping screen when it appears on your business bank statement. If a privately owned bicycle is used for business related travel, the employee may claim 20p per mile under the HMRC approved mileage scheme. Simply record the journey in your mileage log, set the vehicle to bicycle and inniAccounts will take care of the rest. When you next create a payslip the cost of the journey will automatically be reimbursed to you personally. Note that the 20p per mile tax free mileage allowance for business travel cannot be claimed if the bicycle is owned and loaned to an employee by your company (Cycle to work scheme). Provided the purchase is necessary to conduct the activities of the business, the item can be claimed. To give an example, if a technical manual is purchased specifically related to work being conducted, it can be claimed. If however a book or magazine is of benefit personally or is to aid in the development of a new skill, the item will not be tax deductible. In such cases, if it is paid for by your company and enjoyed by you personally it will need to be captured on a P11D for the benefit in kind and result in additional tax and NI liabilities. In these circumstances, it is probably best to pay for the item personally. If the broadband contract is in the company name and therefore invoiced to and paid by your company, then the full cost can be claimed even if there is a small amount of personal use. If the broadband is billed personally and the contract is not in your company name, then only the portion of business use can be claimed. This must be worked out and evidence provided if requested by HMRC. Generally, if the receipt has a VAT number then VAT at the standard rate is included or if the parking is on-street then normally it is VAT exempt. If the £150 is exceeded then tax must be paid on the whole amount, not just the amount that exceeds the £150. It is not an allowance so it cannot just be claimed and it cannot be offset against the cost of more expensive events. You can also provide more than one annual event during the tax year provided the combined cost of the events does not exceed £150 per employee. The event is not just limited to the cost of the entertainment, it can include the cost of accommodation, travel etc. The partners of employees may be invited, again provided the same is offered to all employees. Where a partner attends they also receive a £150 allowance – that’s £300 in total per couple. Typically entertainment of a prospective or existing client is not a tax deductible expense and although it can be paid for by your company, no corporation tax relief will be given. In reality, the true benefit of client entertainment isn’t from the tax deductions but from the gesture and what it can do for your business in the future! As this is a statement that must be filed every year at Companies House, containing up to date information about your company. Therefore this can be claimed as a business expense. If you are using your own vehicle to travel on business and have congestion charges that need reimbursing, then you must reimbursement on form P11D. You don’t have to deduct or pay any National Insurance or tax. However, if you are using a company car then for business purposes that you can claim for the amount and will not have to complete a P11D form. Provided the training is work-related to upgrade a current skill and not to develop a new one, the cost of the training can be claimed along with costs associated with the training such as books or additional travel costs incurred. Should the training be overseas, then the details may be scrutinised in more detail by HMRC. It is recommended that full details of the training be retained including receipts for the course, the course itinerary, evidence of attendance, accommodation expenses that cover the period of the training etc – essentially everything needed to demonstrate that there was no personal benefit. If you borrow money from your company’s bank account and it is not a salary or a dividend, then it’s a loan from the company to you. This is recorded on your director’s loan account and it is said to be overdrawn. The loan can be then be repaid by paying the money back into the company bank account or by the company crediting the loan account using a salary or dividend payment to clear the loan. When crediting the loan account a dividend or salary is recorded but not paid out – it is used to clear or reduce the balance of the loan account. 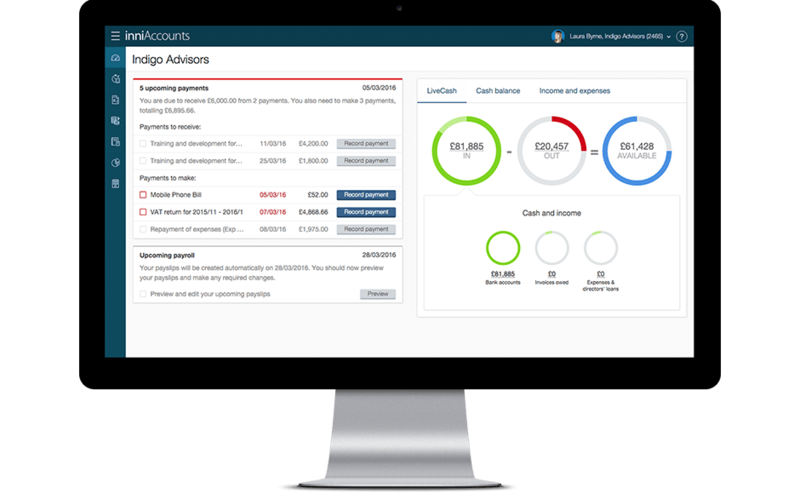 inniAccounts allows you to manage the director’s loan accounts however you must be aware of the potential tax implications both for you personally and your company. If at any point the outstanding value of the loan to the director exceeds £10,000 in the tax year, the company will need to pay Class 1A National Insurance and the director will need to pay additional tax. This is declared on a P11D. Depending on how your loan account is managed, it will determine what you need to tell HMRC and whether you need to pay corporation tax on the loan amount. You must pay Corporation Tax on the loan which currently is 32.5% of the loan value, e.g. if your Directors loan account is overdrawn by £10,000 you need to pay £3,250 in additional corporation tax. You must pay HMRC interest which is non-refundable. You must include details of the loan in your Corporation Tax Return. If you pay the additional Corporation Tax of 32.5% of the loan value, you can reclaim this from HMRC once the loan has been repaid to your company. However, the claim will be made nine months after the end of the financial year in which the loan was paid off, therefore, you may be in for a long wait! It is important that you notify inniAccounts if a loan to a director exceeds £5,000 at any point. Details of how to use the director’s loan account in inniAccounts can be found here. You can claim expenses for repairs and maintenance of business equipment. If you work extended hours e.g. you are contracted for 8 hours per day and you work for 12 hours, it would not be unreasonable to claim the cost of an evening meal. However, if you are contracted to work 12 hours per day the cost of meals would not be allowable. If you regularly use a computer in your day to day activities then the cost of an eye test can be claimed. The cost of glasses, however, cannot be claimed for unless they are prescription safety equipment. Gifts to customers are not a tax deductible expense unless they are promotional gifts worth less than £50 and carrying a conspicuous advertisement for your business. In most instances, glasses and contact lenses cannot be claimed as a business expense. Even if you require glasses to use a computer to fulfil your company activities, chances are that you probably use them outside of the work environment too, e.g. for reading, therefore they cannot be claimed for. If however a prescription is required for glasses that are solely to use a computer for business purposes and they are not used elsewhere, then this is allowable provided you have evidence to support it. Other examples would be welding or safety glasses. To claim for Use of Home as Office Expenses, as a director or employee of a limited company, you must undertake substantive duties related to the main trade of your business at home and furthermore be unable to carry out these duties at your client’s site. So, if you could work at our client’s site but choose to work from home then the tax relief is not available. HMRC allow a flat rate claim of £4 per week for home expenses without the need for keeping receipts but it is possible to claim more for home expenses. If you want to claim for more than the fixed weekly amount, and you use part of your home for business, you can claim for expenses incurred “wholly and exclusively” in the performance of your duties. This means that you can deduct a figure that relates to business usage, which must be clearly separated from private usage. Home expenses broadly fall into two categories: fixed costs and running costs. You can find a full break down of what you can claim, as well as guidance on how to claim for home office expenses, here. Assuming you are not caught by the 24 month rule and you stay away from your main residence for the purpose of business, you can claim up to £5 per night when staying in the UK or £10 per night if overseas to cover incidental expenses such as newspapers, laundry, phone calls etc. These claims do not need to be receipted however it is not an allowance, therefore, you cannot just claim £5/£10 in full and you must only claim the actual amount of the incidentals incurred. The claim for incidentals is over and above the costs of subsistence such as evening meals. To record and claim the cost of incidentals in inniAccounts simply make an entry in the personally incurred expenses section of Quick Entry and make an entry for your incidentals. They will then be reimbursed on your next payslip. Health insurances policies are not classed as a business expense and are therefore not tax deductible. Key man insurance is taken out by a company on an individual within the company. The company pays any premiums and owns the policy, therefore it will also be the beneficiary of any claim. Mileage claims can be made for business related travel only. Often the easiest way to claim for travel costs is to use a personal vehicle and claim for the mileage at the HMRC approved rates. The advantage of using mileage rates is that they are based not just on the cost of fuel, but also costs such as insurance, road tax and maintenance, therefore it saves you having to keep details of your actual motoring expenses. Mileage rates are used to work out the amount that can be paid free of tax under the AMAPs legislation. Using the mileage log in inniAccounts makes this really easy – the claims are paid back automatically to the employee on the payslip plus it keeps track of the 10,000 mile limit and adjusts the rate accordingly. Additionally, if you enter a ‘default mileage’ into your contract you can quickly make an entry into your mileage log by simply clicking the mileage checkbox for each day in your timesheet. As with all expenses, HMRC expects you to be able to provide evidence to support mileage claims, e.g. a mileage log which is accessible in your Report Centre. If you do not maintain a log and cannot provide it to HMRC if requested, then Income Tax and National Insurance will be due on the mileage payments. If you are inside IR35, travel and subsistence expenses are not allowable expenses. The simplest way to claim for a mobile or smartphone is to purchase it through your company and have the contract in your company’s name. This way, even if there is a small amount of personal use, the purchase and contract costs can be claimed. If the contract is in an individuals name and not the company, then only the calls made related to the business may be claimed. If this is the case then an itemised bill will allow such calls to be identified. If the contract has inclusive minutes and only the inclusive minutes are used in a billing period including business calls, then no claim can be made. HMRC are likely to take the view that no additional expenses in making business calls have incurred and therefore a claim is not allowable. To qualify, the expenses must be incurred or the benefits must be provided before the end of the tax year after the one in which your circumstances changed (as outlined in the first step of this list). the new residence must be within a reasonable daily travelling distance of your new normal place of work, and your old residence must not be within reasonable daily travelling distance of the new normal place of work. If your company is to make employer contributions direct into a pension scheme, these will be tax deductible. You should always seek financial advice from an Independent Financial Advisor to determine what is the best strategy for you, be it personal or company pension contributions. You can claim expenses for postage as this falls under stationary. If you are a member of an HMRC approved professional organisation related to your business activities, then the fees can be claimed. HMRC approved organisations can be found here. You cannot claim fees and subscriptions paid to an organisation that HMRC hasn’t approved or if the subscription is a life membership. Provided the requirements of the 24 month rule are met, you can claim for travel and the related costs i.e. accommodation and subsistence. The costs of travel such as train tickets and taxi fares that are necessary for the provision of services and operation of a business can be claimed. Whilst working at a temporary workplace you can claim for lunch but always ensure that the cost is reasonable and receipts are retained. If you are staying away from home then the cost of accommodation, breakfast, lunch and evening meals can be claimed provided the costs are not excessive. If you do stay away from your main residence, then you can also claim for incidental overnight expenses. Meals do not have to be purchased from a restaurant, therefore, a pre-packed sandwich from a supermarket would be an acceptable alternative. You cannot claim for ingredients to make a meal yourself. Your company may be able to save money by purchasing travel cards instead of paying for individual tickets. If you also use the card for personal travel then the personal benefit from your company may result in additional tax / national insurance is due. If however the cost of the business travel had it been paid for by purchasing individual tickets, exceeds the value of the travel card purchase, then the travel card can be used for personal travel and no additional tax / national insurance will be due. More information can be found in the guidance on HMRC website. The guidance on what are allowable expenses is complex and needs to be considered based on individual circumstances. No responsibility can be accepted for the tax status of any expense claims made. The information provided on this page is for the guidance of inniAccounts customers only and no action should be taken without specialist advice. Is the cost of suits for office work reclaimable (i.e. shirts, ties, trousers etc)? I cannot see it listed under the “Clothing” section but in my case it was purchased wholly for conducting business so I’m not sure if it can be classed as a business expense? Unfortunately the cost of a suit / clothing in general are not allowable business expenses because they are classed as your everyday work wear / wardrobe. The only exception is where the clothing meets the criteria of protective wear or if it carries a distinct logo promoting your business. In which category should I record the security man who came once a week in a pub? Yes it would be subcontract costs. If the question also relates to where it should be included on a Self Assessment Tax Return then it should be recorded within Wages, Salaries and other staff costs. On that the page, a monthly fixed allowance is also indicated, beside the weekly one, i.e. “£4.00 (or £18 a month for employees paid monthly)”. More importantly, it looks as though (section 3.) if the employer provides equipment, services and supplies “for both business and private use for […] company directors” then a P11D form must be submitted. I was about to claim the homeworking fixed allowance for myself, for the current tax year, as suggested here on the Knowledge Hub, but, since I am a company director, I guess I would have to submit a P11D form, of which there’s no mention here. Thanks for letting us know about the out dated link to HMRC. Thanks also for digging out the new one! I’ve updated the article with the latest link to HMRC. I hope that helps and thanks again for letting us know and for your question. Hi, would a small suitcase for cabin baggage be an allowable expense? All expenses, to be allowable, must be necessary and incurred wholly and exclusively for the purposes of your business. Therefore if you would also use the bag for personal travel then it wouldn’t be an allowable expense. Can moving home/back to the UK (permanent home in UK and rented out whilst abroad) to incorporate own Ltd co online before my UK move. I would be under Director/employee status and so would/can this be seen as an expense to my Ltd co? I understand a relocation payment of up to £5K can be claimed without paying tax or NI? Is this correct? Many thanks in advance. there was a change in the place where employment duties are normally carried out. To qualify, the expenses must be incurred or the benefits must be provided before the end of the tax year after the one in which the your circumstances changed. In addition, the new residence must be within reasonable daily travelling distance of your new normal place of work, and your old residence must not be within reasonable daily travelling distance of the new normal place of work. Any qualifying costs above £8,000 will need to be reported on a form P11d and tax and National Insurance will be payable. I have just started to work as a self-employed gardener (sole trader) and have a couple of questions about expenses. Can I claim sunscreen and insect repellent as business expenses? Would my own wage be tax deductible under the wages section of the self assessment (I don’t employ anybody else)? Or do I not techically have a wage as all the money the business makes goes to me? And if a friend did some occasional work with me and I charged a client for the total hours worked and then paid the friend, does that count as sub contracting or me employing the friend? Hi Alexandra. The sunscreen and insect repellent would be necessary for you to work and therefore would be allowable. The amount that you pay yourself is not classed as wages as you are taxed on the profit of the business not the amount that you draw. If you pay your friend for work done then yes, it can be treated as labour costs. Can I offset the cost of a financial advisor setting up a pension for my company to pay into against corporation tax? HMRC exempts the first £150 plus VAT of Financial Advice and this must be paid by the company directly to the provider. If the company pays any more than this then it is a benefit in kind for the employees that the pension relates to. I’m using my home as office and I’m currently calculating my repairs cost. Should I only include repairs I have a receipt for? My friend built and fitted my kitchen (like for like replacement) which he purchased from his workplace off the books, so there’s no official receipt. I paid him cash in hand so theres no official transaction either. Even if he can give me a receipt, should I include it. You cannot include repairs to your residence in a Use of Home as Office calculation unless they are wholly and exclusively for the purpose of your business. Obviously a new kitchen would not fall into this definition. Even if you do have repairs that you think would qualify you need to check with your accountant as there could be Capital Gains Tax issues when you sell your property. Under ‘Travel and subsistence’ – I meet the 24 month rule and so am planning to claim lunch. For the first couple of months work I did not retain receipts as my accountant suggested I could claim £5 a day unreceipted, which seemed sensible to me given the far easier records management. I’ve since been looking to corroborate this as it seems a grey area and as a precaution have been collecting my lunch receipts (which incidentally average out at around £5). Do you have any opinion on this – should I now persist with receipting everything and take the first two months as a loss or do you think the £5 a day unreceipted lunch claim is reasonable? One other Q if I may – bike safety clothing needs to be reflective in order to be expensable – I realise this is subjective interpretation but would something which is halfway house between standard clothing and a roadworks hi-viz fluorescent vest be acceptable? Fantastic guide otherwise – many thanks for putting it together! Hi Andrew. You can claim the £5 per day without keeping receipts however there are some qualifying conditions, there are more details in our article ‘Benchmark Scale Rates’. As long as the clothing has some reflective properties then you are able to claim this. Can I claim the cost of a conference (conference fees, travel, accommodation) if it is relevant to my role and industry? Hi Steve. Yes, you can claim for all of the costs associated with the conference as it is relevant to your business. Can the company claim for the costs of a smart tv (for video conferencing) as a business expense? If the smart TV is ‘’wholly and exclusively’’ for the purpose of the business then it can be claimed as a business expense. Can I class car hire as a legitimate business expense in the following circumstance. Then I need transport for the sole purpose of carrying out my contract during the week. Can I claim for car hire? The scenario you describe does sound like the car hire would be ‘’Wholly and exclusively’’ for the purpose of carrying out your business activities and therefore would be classed as an allowable business expense along with any fuel costs associated with the hire costs.